It is the first of April as we set out for our great adventure. As the church choir stills sings its last song, we pack our last bag and head out of Kigali. After a 1-day drill course on the bike which my sister passed impressively, this is her second day on the bike. We drive through Rwanda’s hilly countryside as the sun welcomes us in. After a few hours drive we hit our first border. After hours getting passed the right six offices collecting stamps, we are in Uganda. In Uganda they drive left. Still stamped out I continued my right track, and soon I encounter a car some 100m into the new land. Wondering what this maniac is doing on my side of the lane I flash my lights and speed up a bit, confidently maintaining the middle of my lane. As this not seem to scare of this alleged maniac I figured it is my time to duck and I drive into the side ditch. Another 100 meters down the road there is a signpost saying: ‘keep left’. Wondering what other trouble is on the way with maintaining this level of stupidity we finish our first day’s drive. We find a lonely island on a lake where we peacefully spent the night. 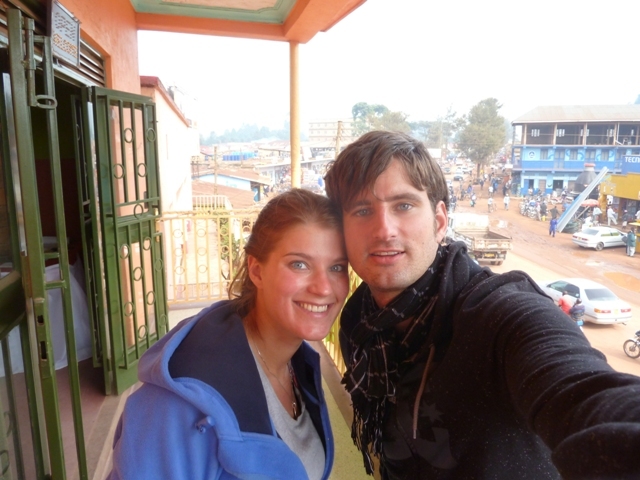 A day after the peace and quiet of our own little island, we hit the capital: Kampala. Kampala turns out to be a disaster; the bustling hustle of its shopping streets, crowded with flocks of people and taxi-motors driving in every direction possible. On top of that I get stopped by a corrupt police officer twice. The first time the cop takes out my keys and commands me off the road. While I was on of the few motos that actually waited for the traffic lights, he deemed I was not neatly keeping the (imaginary) waiting line and I had to pay a large fine. It took me 15 minutes of talking and finally I did the trick by showing my business card (I didn’t have one, so I showed one of a random guy working for another UN organisation I happened to have in my wallet). With the other cop I was less diplomatic and after he told me I was driving a one-way street I start acting lost and ask his help for directions to where I was going. After he gave me directions (and put my keys back in), he started asking for money. This is when I felt it was time for me to leave, and I hit the throttle (and drove into yet another one-way street) leaving the yelling officer behind me in smoke. After the city’s craziness we chill out at lake Victoria, the famously sought after source of the Nile by Dr. Livingstone. The road ahead pointed towards Kenya and its coast. Along this road laughing children, fruit stalls and beautiful scenery wave us by and we approach our second border. Now a very basic understanding of the functioning of borders around the world tells you that there are two sides to every border. By some chance of event we only found one, and completely missed the Kenyan part of customs and immigration. Still waiting for us to pass the Kenyan border we stopped in a small town and asked someone ‘what country is this?’ ‘This is kenya!’ responded the young man with a smile. I smiled back and realised we illegally entered Obama’s birthplace. To tired to bother going back in search of the border, we continued our trip on Kenyan tarmac. While not ‘officially’ welcomed in Kenya proves to be all we were looking for: friendly people, majestic nature, a currency that is easily calculated into euros, zebras along the road and reasonably good roads. Our second day in, we detour off the main road to visit a ancient rainforest, home of the colobus monkey. This black and white creature plays in the canopy above us as we pass through the forest. 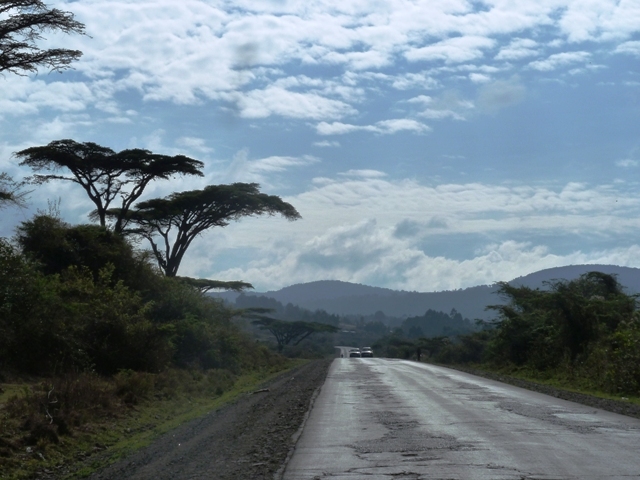 On the road to Nairobi, the capital, we meet zebras and some more monkey on our path. In Nairobi, a former study mate of mine, Felice, warmly welcomes us in and we enjoy a hot shower to wash off all the dust and dirt. Prachtig zoals je ons meeneemt op je reis, dank voor het even wegdromen. Yes whispering hope, Janno op een dag schrijf je een boek met al je Afrika avonturen, en wij krijgen nu alvast de preview, bedankt!